The government is working hard to draft legislation to regulate physician-assisted dying in Canada. We need to make sure those rules put the rights of patients first. Church leaders are already trying to dictate what choices patients should have in religious healthcare institutions, like those in BC that receive $1 billion in public funding. We, the public, should have the final say over what happens in publicly-funded hospitals, not Bishops in Toronto or the Vatican. That's why we need you to write your MP today. Simply use Dying With Dignity Canada's tool and use any of the points in the letter we sent to all BC MPs today. Our Annual General Meeting will be held on Sunday, May 1, 2016 at 10:30 AM at the Oakridge Seniors' Centrein Vancouver. Doors open at 10:00 AM for coffee and muffins courtesy of our vice-president Gord Leslie. You can find details on our website and you can email us if you have any further questions. David Simpson, the Christian Atheist, returns for a controversial discussion about Islam, foreign policy, nuclear proliferation, torture, racial profiling and moral relativism. Purzycki recently published a study in Nature on the role that belief in punitive gods played in the expansion of human societies. Come and learn what role beliefs about gods' minds play in our relationships with the natural world and with each other. University of Lethbridge professor Jim Linville offers an overview of the diverse creation museum landscape in North America. He will highlight the need to look beyond "Big Creation" to truly understand the phenomenon. The bestselling author ofCollapse and Guns, Germs and Steel surveys the history of human societies to answer the question:What can we learn from traditional societies that can make the world a better place for all of us? See all upcoming events on our website. Dr Luhrmann is the Watkins University Professor in the Department of Anthropology at Stanford University. Her work focuses on the way that objects without material presence come to seem real to people, and the way that ideas about the mind affect mental experience. She was elected to the American Academy of Arts and Sciences in 2003 and received a John Guggenheim Fellowship award in 2007. Her When God Talks Back was named a New York Times Notable Book of the Year and a Kirkus Reviews Best Book of the Year. “Morality seems to me to be a natural phenomenon - constrained by the forces of natural selection, rooted in neurobiology, shaped by the local ecology, and modified by cultural developments.” - Patricia Churchland in Braintrust: What Neuroscience Tells Us About Morality. Question: Is she right? 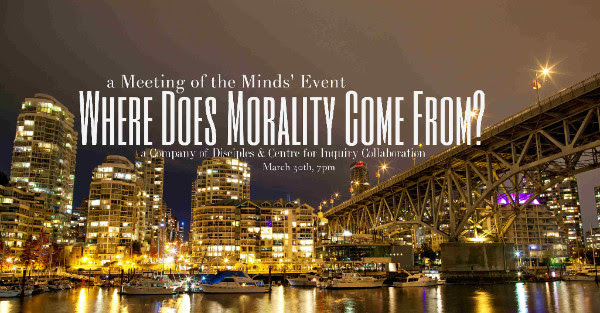 On March 30th, 7pm at the Network Hub, we will kick off our Meeting of the Minds’ 4 part series on morality by addressing the question “Where does morality come from?” with special guests Dr Scott Anderson, professor at UBC’s Department of Philosophy and Neuroscientist, Dr Grace Lee of UBC. We will begin our evening with short presentations by Dr. Scott and Dr. Grace, followed by Pat and myself providing an atheist and Christian response, breakout for small group discussions and conclude with open mic Q&A. Tickets are $5. Coffee and Tea included. Pay online or select "Pay at Door" when registering online. For more info or to register, click "Attend Event".